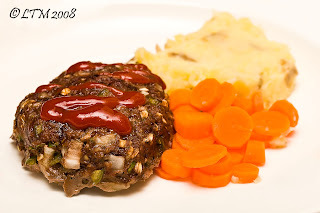 I love meatloaf, and luckily I married someone who loves it too. Actually If you were to ask Luke what some of his favorite meals are that I make I am positive that meatloaf would be on his list. Even Monkey likes meatloaf. So after a fast moving weekend a nice hearty and healthy Sunday dinner of meatloaf, smashed potatoes and carrots was just the ticket, actually in Luke’s words it was “just what the doctor ordered.” My individual meatloaves cook faster than a traditional meatloaf, are easy to serve and are cute too. This recipe makes 4 mini-loaves but could make more or less depending on the appetites of those you are cooking for. Preheat oven to 350 degrees. Using your hands mix all ingredients, excluding ketchup, until well mixed in medium bowl. Do not over work the meat. Line baking pan with aluminum foil. Divide meat into four balls. Use palm to flatten each ball into a loaf or mound shape. Top the loaves with desired amount of ketchup. Bake loaves for 25-35 minutes or until the loaves reach an internal temperature of 160 degrees. Yeah, I’m Lazy. So What? !